The United States Agency for International Development is about to go through a period of considerable change. The new Administration has vowed to make large structural and financial changes to federal agencies, and has proposed massive cuts to foreign assistance funding. Changes at USAID have been accelerated in the past week, with acting administrator Wade Warren releasing a draft of the changed mission statement early this week, and the U.S. Senate unanimously voting Ambassador Mark Green in as the new A dministrator yesterday. It has been no secret that the Administration would like to take a step back from foreign aid and focus on "America First", a plan that has many international development experts worried about the future of foreign assistance programs and cuts an unclear path forward for USAID. But with the confirmation of the bi-partisan-supported Green and a new innovative foreign assistance restructuring proposal by MFAN steadily gaining traction, IHC Global is hopeful for the future of US foreign assistance and whatever its institutional shape, for an enhanced ability to address complex development issues, such as rapid urban growth . Read a Brookings Institution article on what "America First" means for foreign aid here. For more on IHC Global's perspective on the changes at USAID, keep on the lookout for a new blog next week. A new report has been released from Water 2017, a one year nonprofit effort to encourage the U.S. Administration and Congress to prioritize global water security. The report highlights the global issues that stand in the way of universal water security, including the increasingly pressing urban issues, such as the stress increased migration to cities is putting on water resources, inadequate urban food and water support systems, and the worsening risk of disease outbreaks through water in urban areas that are unequipped. After careful consideration of the issues facing water security and dialogues with a range of U.S. agency officials, non-governmental organizations (NGOs) and faith-based organizations, and academic, corporate, and think tank experts, Water 2017 proposes developing a unifying vision with a holistic approach to elevate and integrate global water security as a national priority across the "three Ds" of U.S. foreign policy: development, diplomacy, and defense. IHC Global is in support of a holistic approach, as these are inter-related issues that need comprehensive urban solutions and should not be addressed in isolation. Across the world, migrants are making new homes in cities in greater numbers than ever before, and cities are often becoming overwhelmed, searching for solutions on how to best manage the huge population increases. A new report from 100 Resilient Cities outlines the new tech that is being used to help cities take on the challenges of mass migration, in ways that include tracking population shifts and connecting directly to refugees to provide services. The report lists the new tech services, including data analytics and smartphone apps, that are specifically designed to help with refugees, and the cities and companies that have already put them into effect. These inspiring new programs are a good example of how smart cities can take everyone into account, in order to create the best city possible. Morning: Futurist Rebecca Ryan will challenge you to design a bold vision for your professional future. Lunch: Bestselling author of 13 Things Mentally Strong People Don't Do, Amy Morin will counsel you on mental toughness. Afternoon: Organizational behaviorist Sreedhari Desai will help strengthen your negotiation skills. A common narrative that accompanies discussions of increasing urban density is that there will not be enough resources, such as food and water, to accommodate rising populations. While a lack of resources is a pressing issue that must be dealt with, communities are adapting innovative ways to obtain needed resources. Wastewater from cities, as in water that is a byproduct of human processes, is growing as fast as the urban areas it comes from, and it can help to meet the demands of food security worldwide, especially in developing regions. A new study from IOP Science shows that wastewater is already being used to cultivate vegetables, grains, animal feed, and fish on a larger scale than previously thought; the practice is widespread among farmers outside of urban areas, who now have a high level dependence on the wastewater deposits. However, the study has shown that as long as most wastewater remains untreated, a problem in many low and middle-income countries whose water treatment programs haven't kept up with population growth, some 885 million people are at health risk through the food chain. Without action, diseases like cholera could be spread as a consequence of contaminated produce, and the increased food production allowed by the use of wastewater will be all for nothing. It is strange to understand waste-laden and polluted water as a useful and potentially game-changing resource for sustainable cities. But local and national officials recognizing wastewater for the value it has is an important step towards meeting the health and safety challenges that accompany it. Countries with poor waste management systems, especially those in West Africa, are particularly vulnerable to these growing issues, and the current investment programs to improve their infrastructures are too weak and underfunded to actually create any meaningful change. But ensuring food security and preventing the spread of disease are high-priority issues for many of these countries even if sanitation is not, and combined with the potential that wastewater has to contribute to economies, improving water infrastructure can be packaged as a shiny investment for national governments to take advantage of. This issue in and of itself is a perfect example of how interconnected and interdependent all these facets of society are, and shows how strong the connection is between urban and rural, a relationship that will continue to grow more symbiotic the larger cities become. Given these connections, the holistic strategies (treating the problem as a whole, not as individual parts) mentioned in the new report from Water 2017 are more relevant than ever, and should be considered the best practices for improving water systems around the globe. This is a time sensitive issue; acting fast could save lives and provide a foundation for years of stable food security, and considering the current global attention placed on water and food, the time is now. The deadline for the The Dubai International Award For Best Practice is fast approaching. Get your applications in by August 31st. Learn more here. What does "cosmopolitan bias" really mean? And is it actually a problem? The transformed parks of Atlanta could be the future of urban green spaces. Seven cities have turned their polluted waterways into the go-to places for swimming. Can bike-share programs help solve congestion? Lisbon is willing to bet on it. 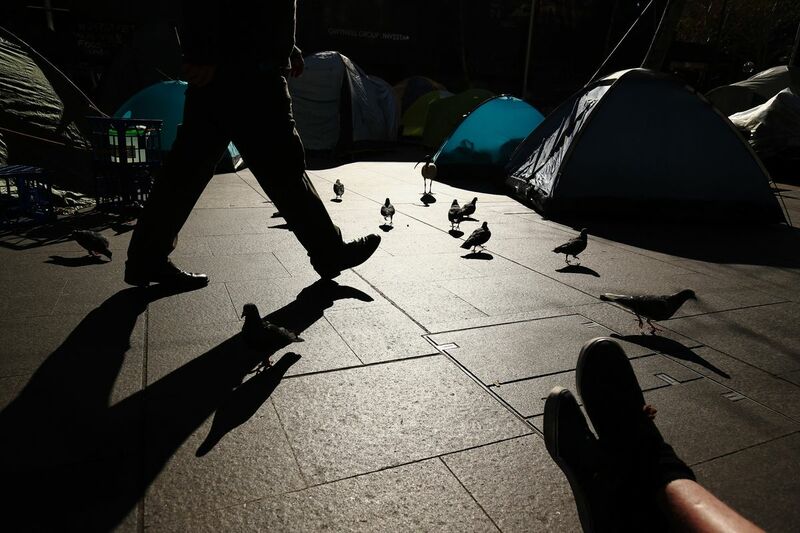 This week in cities: a man walks by tents pitched by the homeless at Martin Place in Sydney, Australia, on August 1st. Sydney is currently in the throes of a massive housing affordability crisis; prices have increased by a whopping 127 percent since 2009.